Hillary Clinton played a decisive role in the decision to destroy Libya's Qaddafi regime. 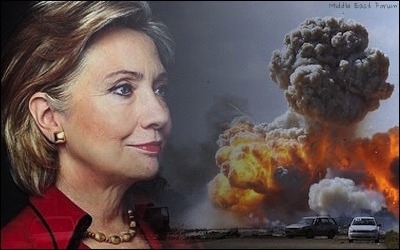 Although Hillary Clinton lost her bid for the White House in part because of lingering public resentment over the 2012 terror attack that left four Americans dead in Benghazi, history will judge her even more harshly for her decisive role in the preceding U.S.-led military intervention in Libya. In fact, then-Secretary of State Clinton was instrumental at three critical junctures in convincing President Obama to green-light and escalate the war to oust Libyan leader Moammar Qaddafi. First was her decisive role in the initial U.S. decision to lead a NATO air campaign in Libya. Under intense pressure from European and Arab governments to stop Qaddafi's forces from stamping out the incipient rebellion, Obama administration officials were deeply divided. Those opposing intervention included Vice President Joe Biden, National Security Advisor Tom Donilon, and Defense Secretary Robert M. Gates. Those in favor included Samantha Power, a senior aide at the National Security Council, and UN Ambassador Susan Rice. Although Secretary Clinton ostensibly took no position at first, she worked to pave the way for the intervention Power and Rice were urging by brokering an Arab League resolution calling for an internationally enforced no-fly zone. With that in hand on March 12, she flew to Paris to meet with European officials and Libyan opposition leader Mahmoud Jibril, after which she pressed Obama heavily to intervene. Gates later said that Clinton's advocacy "put the president on the 51 side" of a "51-49" decision to intervene. There's little reason to believe Libya would have faced a humanitarian catastrophe if Qaddafi had won. So what if the Obama administration had allowed regime forces to win? Qaddafi's Libya was no democracy, but it was an occasional partner in the war on terror and its human rights record was steadily improving. Indeed, one of the reasons radical Islamists were so well poised to seize control of the revolt is that Qaddafi (unlike other Arab dictators) had freed the large majority of them from his prisons. There's little reason to believe that Libya would have faced a humanitarian catastrophe if Qaddafi's forces had pacified the revolt. Their subsequent recapture of Zuwiyah and other towns in early March had not produced mass civilian casualties. Sensationalist reports of mass rapes, mercenaries, and protester-murdering helicopters that animated calls for intervention in the early weeks of the war were later debunked. Second, Clinton was influential in pressing for and publicly legitimating the administration's shift from protecting civilians to overthrowing Qaddafi. This was not "mission creep" — it was decided before the first bomb fell. Clinton pressed for the U.S. shift from protecting civilians to overthrowing Qaddafi. While Obama was very reluctant to green-light this escalation, Clinton was less concerned that "every step puts you on a slippery slope," recalled then-White House Mideast advisor Dennis B. Ross, paraphrasing her view as "we can't fail in this." Although U.S. officials maintained throughout that the NATO intervention was strictly intended to protect civilians, Gates later acknowledged this was "fiction." NATO interpreted UNSCR 1973 to be an open-ended mandate to pummel Qaddafi's forces until "the regime has verifiably withdrawn to bases all military forces." In other words, until the regime accepts military defeat and loss of power. Though unwilling to give up power completely and unconditionally, Qaddafi continually appealed for cease-fires and dialogue throughout the war, via such intermediaries as retired U.S. Navy Rear Admiral Charles R. Kubic, Turkey, Greece, Malta, the African Union, and UN Secretary-General Ban Ki Moon. "Come France, Italy, UK, America. Come, we will negotiate with you. Why are you attacking us?" the Libyan leader pleaded in an April 30 televised address. There's no reason to believe that Qaddafi and secular rebel groups couldn't have agreed on a "pacted transition" to democracy that allowed regime elites some temporary role in government, as Islamist forces had not reached anywhere near their peak strength in the late spring of 2011. At least three senior State Department officials expressed misgivings about overthrowing Qaddafi — Director of Policy Planning Anne-Marie Slaughter, Assistant Secretary of State Philip H. Gordon, and Jeremy Shapiro. But the Libyan leader's pleas were ignored. When the last NATO air strike of the war hit the dictator's personal convoy as he attempted to flee his encircled hometown for exile abroad in October, leading to his capture and ad hoc execution, Clinton exclaimed giddily, "We came, we saw, he died." 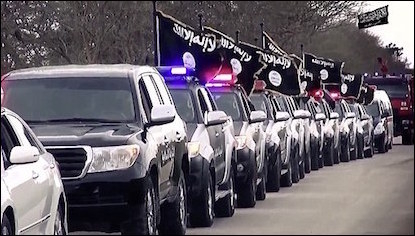 A fleet of ISIS vehicles parades through Benghazi in February 2015. Jibril and other Libyan secularists might still have gained military superiority on the ground were it not for a third fateful American mistake. With Qaddafi's forces holding their ground despite weeks of NATO airstrikes, Washington approved and facilitated a massive Qatari arms lift that largely bypassed the secular National Transitional Council (NTC) in favor of radical Islamists. Those involved in this fiasco haven't revealed much about it in contemporaneous emails or subsequent congressional testimony, but it's clear that Clinton was an early advocate of covertly funneling arms into Libya and personally oversaw official communications with the Qataris throughout. Clinton still denies responsibility for the war to oust Qaddafi. Owing to the combined impact of Secretary Clinton's three errors in judgment, Libya today is a central logistical and operational hub for ISIS and other violent Islamist groups across North Africa and the Middle East. Nevertheless, she continues to deny responsibility for the war to oust Qaddafi. "The decision was the president's. Did I do the due diligence? Did I talk to everybody I could talk to? Did I visit every capitol and then report back to the president?" she said on the campaign trail last April. "Yes, I did. That's what a secretary of state does. But at the end of the day, those are the decisions that are made by the president." History doesn't cut the unrepentant any breaks. Gary C. Gambill is a research fellow at the Middle East Forum. Teri Blumenfeld is a researcher at the Investigative Project on Terrorism and the Middle East Forum.